Tells petitioners to submit a questionnaire based on the presentation. There’s some discussion on getting the equipment for the PowerPoint presentation. Judges and petitioners are going through the word document of the presentation. CEO UIDAI has been granted permission to make a presentation at 2.30 pm. Petitioners allowed to put their questions in writing on Tuesday. Attorney General (AG) wants to limit audience to counsels appearing in the matter considering paucity of space. Chief Justice of India smiles. Attorney General continues reading from ID4D (World Bank report and it’s sustainable development goals). Talks about the paramount importance of unique identity and eradication of poverty. Still reading from it. Lots of jargon. Too many occurrences of pretentious terms like “stakeholders” etc. Still reading….from pages 25 and 26 in the report above. 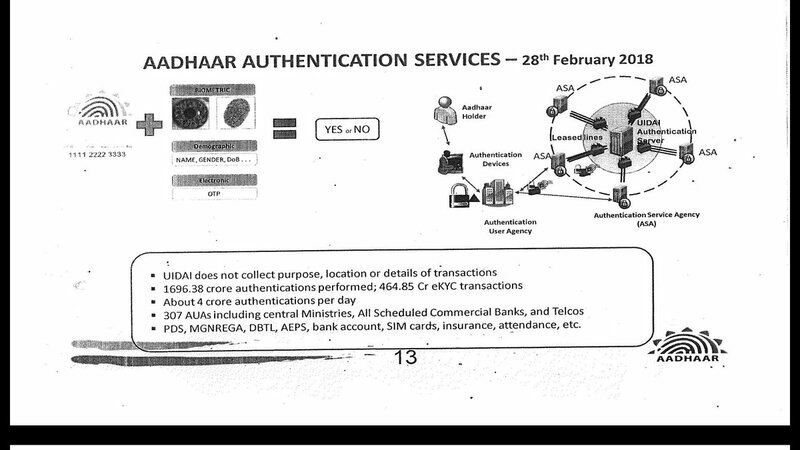 Still reading…at one point, AG says India has transferred 9000 crores to set up and operate UIDAI. (No further details). Justice DY Chandrachud queries about authentication and enrolment services fees. Attorney General says that as of today both enrollment and authentication services are free. Concludes saying the goal is to comply with Sustainable development goal of legal identity for all by 2030. Says India has taken a leap ahead of all other countries. As big an exercise with 1.2 Billion enrollments have not happened anywhere else, he asserts. Justice Sikri and Justice DY Chandrachud in discussion ( My wishful thinking mind voice speculates that it is about how a programme trying to implement a sustainable development goal could be a Money Bill). Attorney General hands over a list of dates on the history of the Aadhaar programme. He makes the point that Aadhaar is not a casual venture undertaken in a routine manner..but a lot of thought has gone into the programme. Also hands over a compilation of all related documents. Justice Sikri asks about the relevance of all these documents beyond demonstrating that much effort has gone in. Says that does not answer constitutionality questions of the Act. Justice DY Chandrachud points out that as far back as Aug 2009 it appears the need for legislation was felt. Asks why it took till 2016. PPT about to begin. One of the two installed projectors does not work. The one facing the judges is thankfully working. Chief Justice of India unhappy with the projector angle. Being adjusted. But the rectangular slide has taken a shape of a different quadrilateral on the screen though. 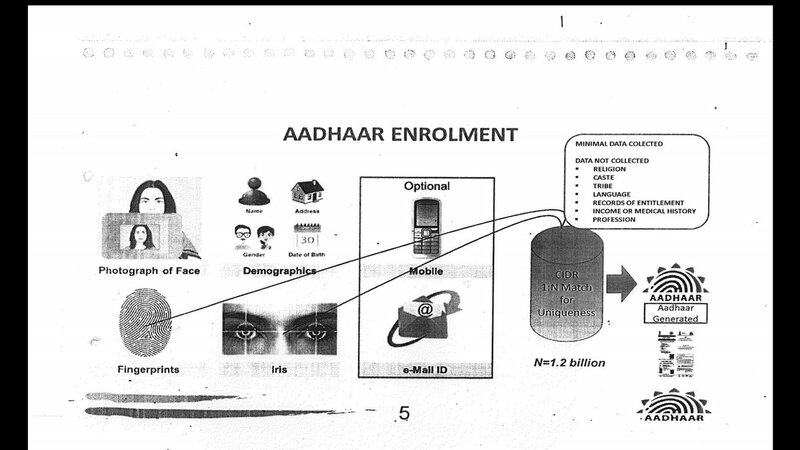 CEO of UIDAI, Dr. Ajaya Bhushan Pandey commences his PowerPoint presentation on Aadhaar. Many people did not have a nationally acceptable id. Even I didn’t have an ID since I come from a small village. From 2000-09 also, people didn’t have IDs. All ids are limited in their own way. Voter ID also doesn’t solve the problem. Children can’t get it (EPIC!). 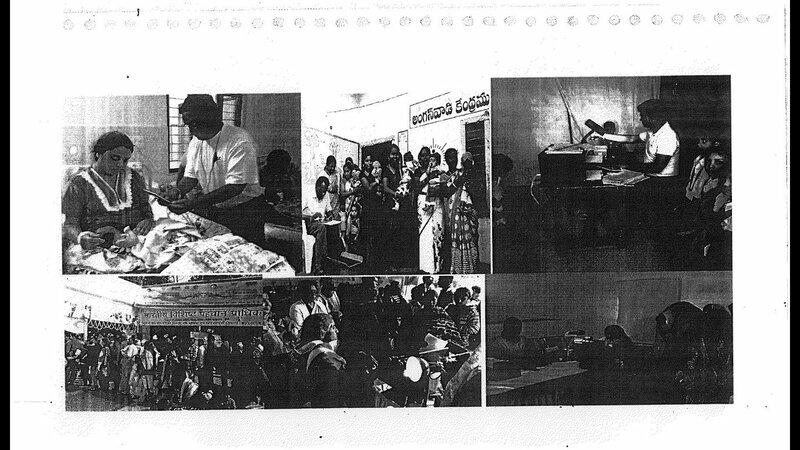 Getting a ration card was also difficult because it required other IDs to procure a ration card. Voter id and ration cards are region specific. It’s not nationally accepted. Aadhaar is nationally verifiable digital ID. It’s not difficult to procure. Genuineness of ration card is not easy to ascertain. 12 digit numbers are completely random numbers. Once issued, it’s never issued again, even if the person dies. We did not want to link it with citizenship and includes transgenders and children. People may not be able to provide biometrics due to reasons like leprosy, but we have made exceptions for such cases. Enrollment and updation can happen in any part of the country. It’s a portable entitlement. Not region specific, unlike other IDs. There’s no data sharing without consent. Only on the instructions of district judge and for national security, data is shared. Fondly recalls that he joined UIDAI even before the first Aadhaar number was issued and is happy with having been part of every milestone that it has achieved. Reads and explains each bullet from this slide. 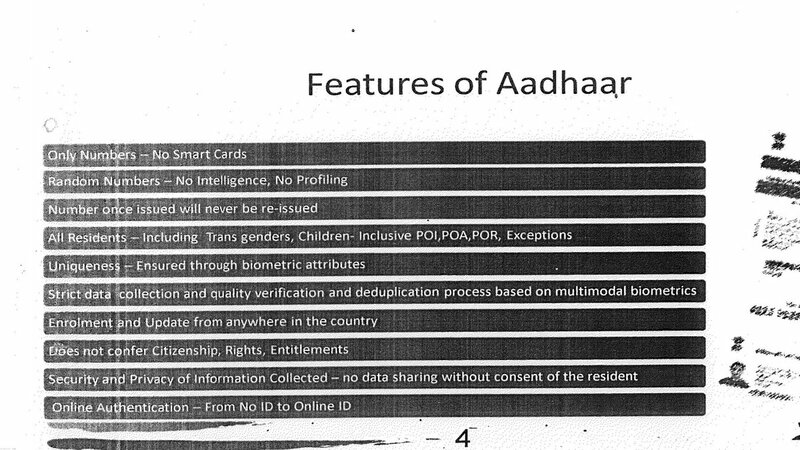 He is now explaining the enrolment process and asserts that UIDAI collects very minimal data. Says even father’s name is not necessary. No info on religion, caste etc is collected. Contrasts that with the US SSN application process which is a data overload. In the US, to get a birth certificate, a lot of information is collected. Even info like the kind of pregnancy is taken. explains how there is no de- duplication of Aadhaar. 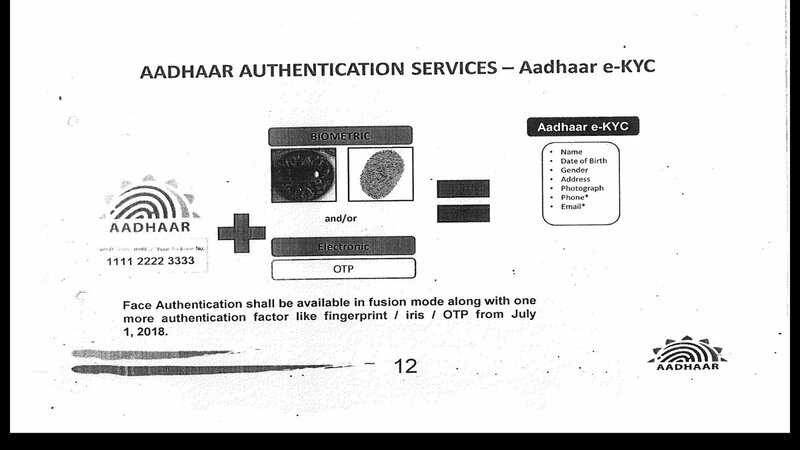 Justice DY Chandrachud wants to know how a biometric exception enrollee get authenticated. Dr. Pandey explains that they will have to use other modes of authentication like OTP or Demographic authentication. Refers to Aadhaar Authentication Regs. ABP elucidates on the types of authentication mechanisms available under the Act. Says there will be 13 modes of auth if you take 10 fingers plus 2 iris plus OTP! Enrollment agencies are both public and private. We empanel these agencies based on certain criteria. Then registrars decide of an agency is fit to be an enrollment agency. We have operator certification agencies along with 30k enrollment centres. Decentralized enrollment, but the data is stored in a centralized place. Says 256 is the standard..but Aadhaar has a much superior hardest to break 2048-bit encryption standard. It’ll require the strength of the entire universe to break that encryption! Traceability of all actors is ensured through audit trail. Justice Sikri asks the pertinent question. The complaint of the petitioners was that at the information can be take at time of capture or before transmission. Pandey asserts it is not possible. Says all machines are STQC certified and software are all UIDAI provided. 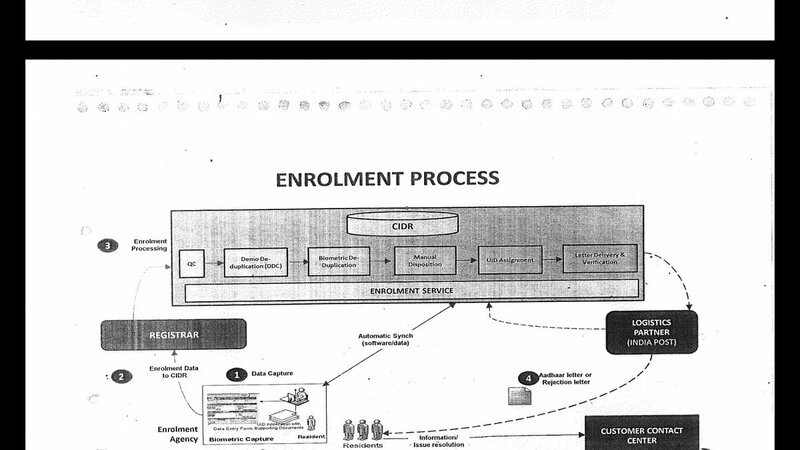 Justice Sikri: Why did you de register/ blacklist 49000 enrollers then? Pandey says it was due to corruption mostly. Also some operators were not entering the details properly. Says that they have very strict quality control standards. says: People who took money for enrolments. People whose demographic data quality is very bad etc. Justice Sikri does not look convinced that 49000 would be this way. Pandey says some of them also misused the biometric exception. Says some of them also registered a tree or hanuman etc earlier…says they used to trust enrolment operators a lot earlier but they no longer do and have more stringent quality control. Justice Chandrachud asks about world bank report saying under 5 not having id. Pandey says even infants can have aadhaar. We don’t check for 182 day limit. There is an eye roll in many of the lawyers in court. 120.3 cr have enrolled. We enrol children as soon as they are born. We don’t take biometrics of the infant. Only photograph is taken. Biometrics of parents are collected. At the age of 5, we take the child’s biometrics and then again at age 15. Justice Sikri: Do you contact the child or do they have to come to you? This was one of the arguments related to exclusion. Pandey says that anganwadi workers themselves become enrollers. Also, enrollment camps are set up in schools. For others he says they can. …go to enrolment centres and they also do update. Justice Sikri asks if they take Parental consent. Pandey says all legal compliance has to be taken care of. Justice Chandrachud asks how are biometric update done? What happens when a person’s biometrics change? For eg, for workers and labourers. ABP says that people can go to enrolment centres and get their details updated. Justice Sikri wants to know how does one know that one’s biometric has changed? Says there are so many technically illetare and illiterate people and how they know when to update. Pandey says that in such cases, a person goes for authentication, for example to a PDS shop and his Biometrics don’t match, then an error code is sent to UIDAI and then the person will be asked to update his biometrics. Says Section 7 and Regulation 14(1)(i) make sure people are not denied in the meantime. Justice Chandrachud is not convinced with this method. Says this will lead to exclusion. Pandey says a circular was issued yesterday, which said that if a person’s authentication through biometrics does not happen, then he shall not be denied benefits for that reason. Says how QR code in the Aadhaar card itself has some smartness built into it. Flashes the QR code in his Aadhaar card! Justice DY Chandrachud asks that UIDAI does not know if denial of service happened but only if auth failure happens. Pandey answers in the negative but says they constantly advise ministries that on the ground there will be exclusion if they solely depend on Aadhaar auth. Says that we tell entities to make exception handling measures. Which is why in law, they made exceptions and that any official not obeying and denying services would be taken a strong view of! Justice Chandrachud asks if there is any data on denial of services. Justice Sikri asks about shopkeeper appropriating the grain by saying biometric mismatch. Pandey says Aadhaar cannot cure every kind of malaise referring to Jharkhand case. Says atleast now we have proof that it is the ration shopkeeper is caught. Earlier he could not be. Pandey says 100% auth success is NOT possible. Many variables, connectivity, machine not working, etc etc. But asserts that Aadhaar Act takes care of it. Justice DY Chandrachud and Justice Sikri unconvincedly look on. 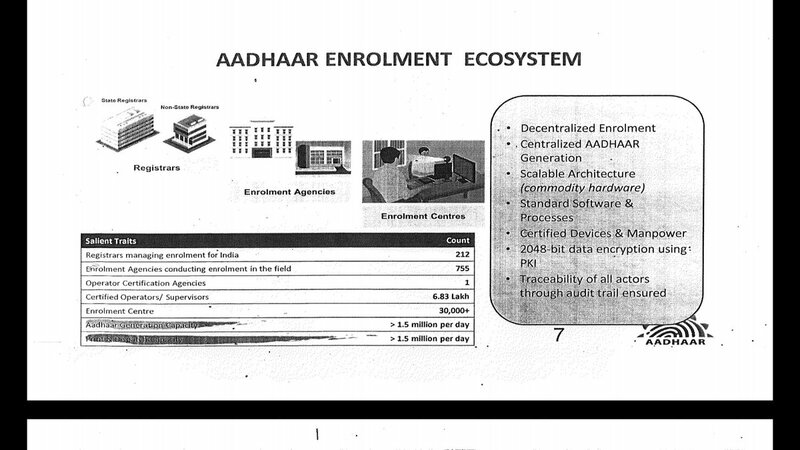 Pandey says Aadhaar enrollment is done in prison also. Now says at the Govt level a decision has been taken that enrolments will happen only in banks, govt offices and post offices. Says enrollment and updation of Aadhaar is a continuing process. The total cost of an aadhaar card is less than one dollar. Justice Khanwilkar asks about software not being Indian and is prone to tampering. Pandey says only the biometric match software is licensed from foreign companies. World’s best companies in that industry he says. Rest has been developed in India. Says those software run on our data center. Says they are all 6000 server farm..very very powerful. Pandey says just because Banks use SAP or Oracle, does not mean Banks give data to Oracle. The biometrics is also anonymized (by a reference no.) before it’s matched against the biometrics stored in the central database. Says that these algorithms are their IP just like how Microsoft has IP in Windows. Says there can be no false positive dedups because there is also a manual override process. Proudly says the contact centre at 1947 receives almost 1.5 lakh calls a day…one of the largest, he says! Takes the court through the e-kyc process using Aadhaar. Says in 1.5 years no request for biometrics from govt for anyone! Had denied data to CBI also. We have registered devices for authentication. The devices use our key for encryption. The biometrics is not shared with the requesting entity also. Authentication process takes less than a second. We don’t collect purpose, location and details of the transaction. Auth data is not transmitted to CIDR! Justice DY Chandrachud asks about meta data. Pandey says he will come to know. Says he’ll explain that later. Pandey says we are doing four crore authentications everyday. We don’t know the purpose of these authentications. Bench rises for the day even as Pandey says information remains in the silos and merging of silos is also prohibited.